Anyway, to this album, the 4 singles released in the UK didn't even make the Top 40 which is surprising. 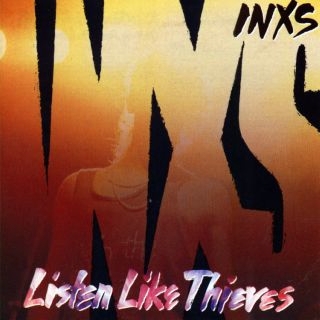 The title track "Listen Like Thieves" had a Rolling Stones Rock vibe, saxophone parts, typical guitar riffs and a funky bassline, with Michael Hutchence giving his almost Mick Jagger-like vocals. Absolutely loved this song on first listen. "Kiss The Dirt (Fallng Down The Mountain)" was similar to songs on the previous album "The Swing", a little more Pop and a swaying gentle song with a lovely chorus. "What You Need" was similar to the title track, it had a bit of everything which was unusual in Rock songs at the time, it became a big hit in the USA though! The fourth single was "This Time" which was the worst placed UK chart entrant but it was a great song, reminding me a little of SImple Minds early material united with Crowded House style melodies and easy listening vibe. "Shine Like It Does" is Classic 80s Pop Rock, the band find their niche, lyrically and musically a brilliant track, which progressed later and brought us the classics such as "Mystify" and "Need You Tonight". "Good And Bad Times" is a mix of searing guitars, powerful vocals, and funky riffs and keyboards, a heavier backing than the singles exploring their Rock. Some moments remind me of New Romantic summery saxophone elements akin to Duran Duran and Spandau Ballet in 1983 but essentially this is INXS Rock at its best. 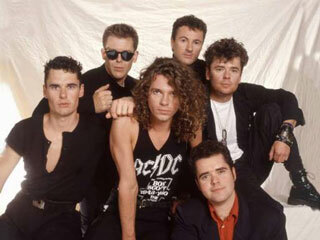 "Biting Bullet" is a venture back into the old INXS sound of the debut abum with a catchy chorus and fast paced tempo, similar to the early songs, the debut single "Simple Simon" and "Just Keep Walking". The one disappointment on the album is "Three Sisters", quite obviously a filler, its an experimental Electronica/Howard Jones style track which is pretty uneventful or attention grabbing. "Same Direction" is Classic Rock at its best, a Simple Minds/Mick Jagger hybrid while "One X One" is a strange one, it reminds me of Go West, Thomas Dolby, Howard Jones and The Smiths all rolled into one, but it works! Great song. The album ends with "Red Red Sun", Punk rebels meet The Specials! Manic ending to the album with unconventioanl guitar riffs and feedback galore. Kocham zespół INXS i bardzo kocham Michaela Hutchence, jego głos, charyzmę, no i oczywiście urodę. Szkoda, że tak wspaniałego artysty nie ma wśród nas !